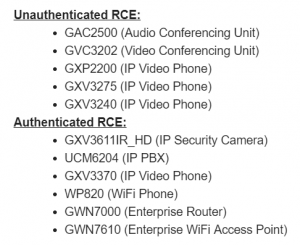 A series of both unauthenticated and authenticated remote code-execution vulnerabilities have been uncovered in a variety of Grandstream products for small to medium-sized businesses, including audio and video conferencing units, IP video phones, routers and IP PBXs. 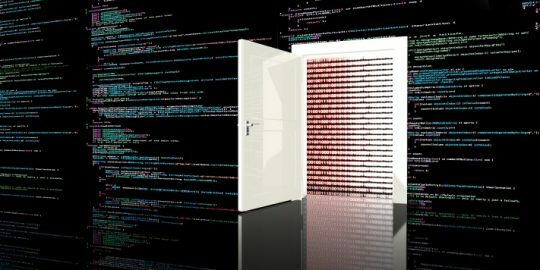 According to Trustwave SpiderLabs research released on Monday and shared exclusively with Threatpost, compromising these devices can allow an attacker to start scanning, installing remote access trojans and attacking other machines on the network that would otherwise be inaccessible; or install arbitrary applications. Attackers can also use the vulnerabilities to gain access to cameras and microphones to turn them into listening devices. 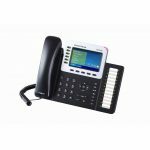 Thus, another danger involves the fact that the affected IP video phones also integrate with their own security door systems. 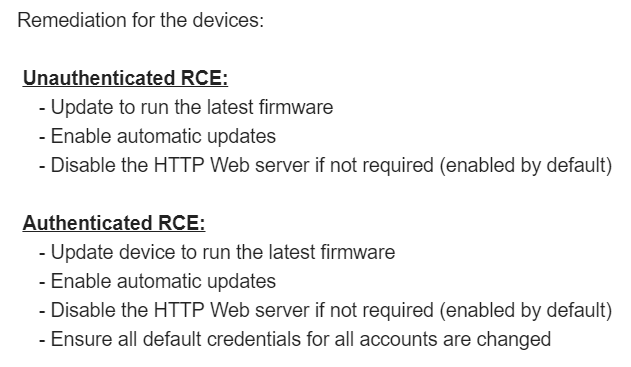 And finally, an attacker could also uncover the account passwords for the device (which are stored in plain text) which could be helpful in gaining access to other systems on the network if they’re reused. 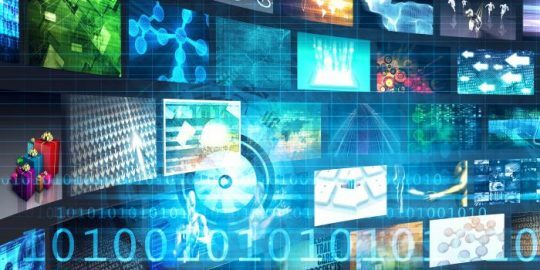 There are more than 135,000 of these devices quickly searchable on Shodan and publicly exposed, according to the research, with a large subset of them that are vulnerable. It’s also possible that other devices in the Grandstream portfolio contain bugs. “All other models and end of life products have not been tested, however it’s likely they’re all running very similar firmware and also vulnerable to these attacks,” Scarvell said. In the real world, these vulnerabilities (details of which are in the advisory) could be exploited in a few ways, according to the researcher. 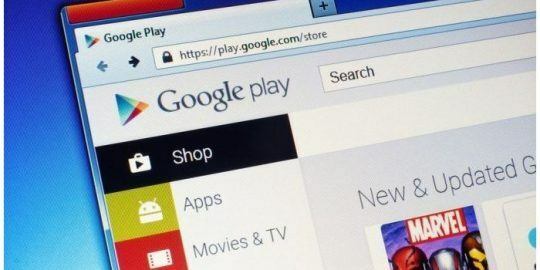 For one, an attack could be as simple as sending an HTTP request to a device on an internal network or to a device on a misconfigured network which has exposed it to the public internet (which is where the Shodan connected device search engine comes in). 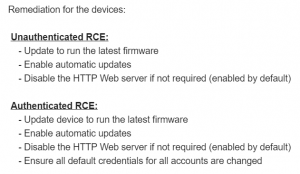 The bad news doesn’t stop there, either; all of the unauthenticated remote code-execution (RCE) bugs can also be used in cross-site request forgeries (CSRFs) by an attacker hosting a malicious web page. 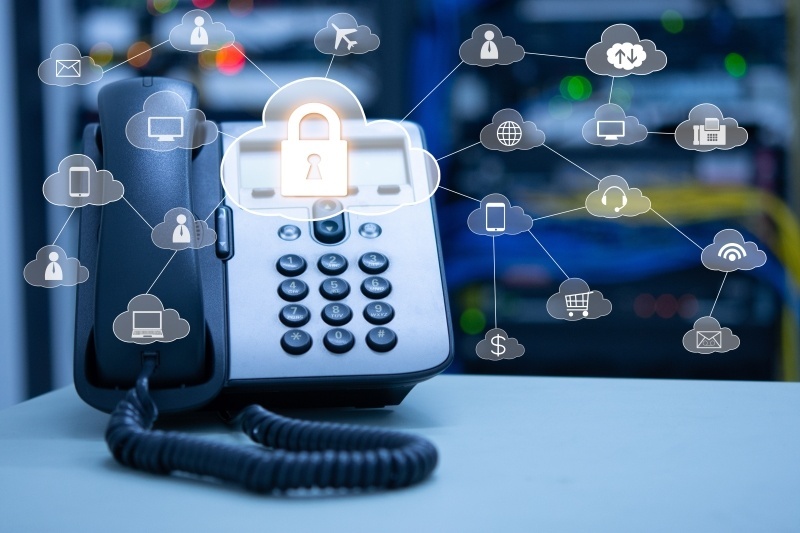 Due to a vulnerability in the way the phones and audio/video conferencing units check authentication, this malicious webpage can be used to attack a visitor’s local network on a drive-by basis. Users can protect their networks by upgrading to the latest firmware in most cases; the vulnerabilities were initially reported to Grandstream on December 6th, and the last device was deemed fixed March 1st. 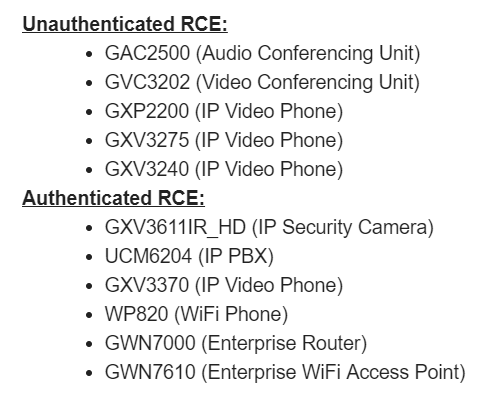 However, Trustwave said that the patches provided for the GAC2500 (an audio-conferencing unit) aren’t sufficient, and that the vulnerability still exists. Disabling the web interface on the device will stop an exploit from working until Grandstream provides a patched version. Threatpost reached out to Grandstream and will update this post with any additional patch information or comments. 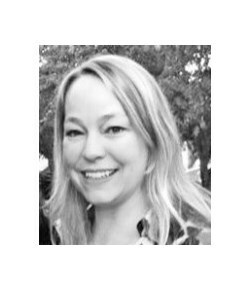 In general, medium-sized businesses (SMBs) can take on basic security approaches to protect themselves from exploits from these kinds of vulnerabilities. Some specific advice for these devices would be to ensure all devices are up-to-date and running the latest firmware; turn on automatic updates; change all default credentials on the devices for all accounts; run the devices on a separate network from those accessing sensitive information; disabling access to all services that aren’t required on the device; and upgrading any end-of-life devices that are no longer receiving security updates.